Women in the east Paris district of Chapelle-Pajol are claiming that they cannot leave their homes without being subjected to verbal abuse from migrants in the area. Over the past year or so the district has become a no-go area for women as migrants and drug dealers have flooded the area. Dozens of these groups of young men crowd the streets, harassing women who walk by wearing what they consider to be immodest clothing Le Parisien reports. An 80-year-old female resident is said to have totally stopped leaving her apartment after being sexually assaulted as she was returning home one day. Aurélie, 38, who has lived in the area for 15 years said that the cafe below her apartment has turned into an exclusively male establishment. “I have to listen to a lot of remarks when I pass in front, especially since they drink a lot,” she said. “A few days ago, the simply standing by my window triggered a flood of insults and I had to lock myself in my apartment. I used to walk down the Boulevard de la Chapelle from Stalingrad [metro station], even late at night … It’s unthinkable today,” she added. The Stalingrad metro was the former location of a large makeshift migrant camp in Paris which was cleared and relocated to Porte de la Chapelle. 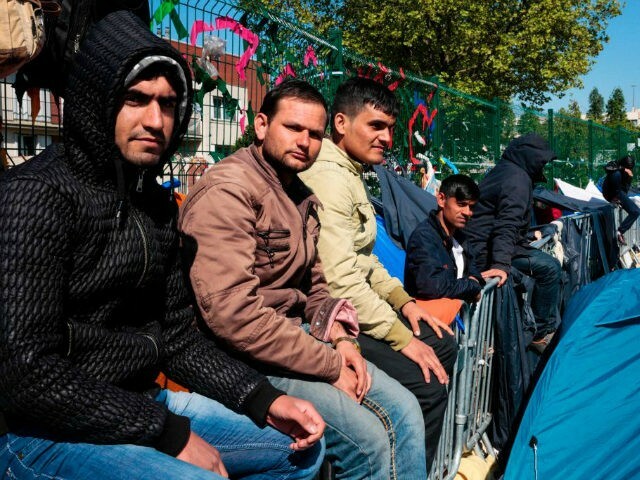 Earlier this month Breitbart London visited the camp and talked to the migrants there. All blamed Europe for their situation and demanded handouts from the French government. Another woman said she would not allow her 12-year-old daughter to walk the streets of the area alone anymore. She said that after getting off at the Chapelle metro station she ended up in the middle of a brawl of migrants who pulled knives out and threatened her with them. “I thought my last hour had arrived,” she said. Due to mass migration, the situation in various parts of Paris has rapidly deteriorated over the last few years. Various suburbs of Paris, such as Seine-Saint-Denis, have become breeding grounds for radical Islam according to France’s top expert on the subject, Gilles Kepel. The women of Chapelle-Pajol have said they will organise a walk around the area with female city officials in order to bring attention to the problem and perhaps find a solution. So far newly elected French president Emmanuel Macron has not addressed the issue of safety in the French capital, using his first weeks as president to court the approval of German Chancellor Angela Merkel instead.